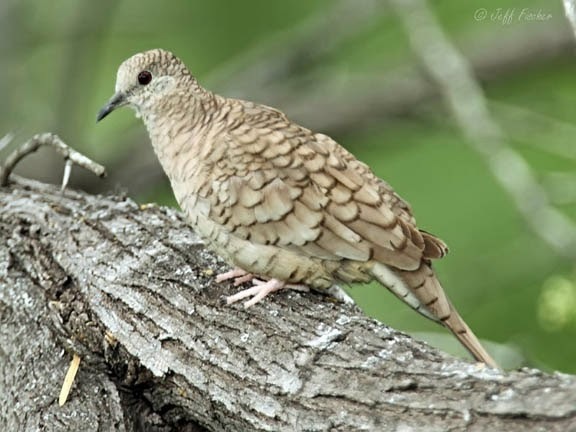 The Inca dove is a species of dove that is found in Texas, Arizona, New Mexico, Mexico and parts of Central America. Since this bird nests in tropical climates it is not migratory. They can often be seen foraging on the ground for seeds. They are also known for perching together in a pyramid form with birds perched on the backs of others up to three levels high. In 2007 an Inca dove got really mixed up and ended up in Two Harbors Minnesota at the beginning of winter. Needless to say a tropical bird does not have much chance of surviving a Minnesota winter. So after a few weeks of being viewed and photographed by birders throughout the north the bird disappeared and presumably perished. That was my first experience with an Inca dove since then I have photographed them in Texas where they are fairly common. Thank you for this piece of information! Good word for I.
Oh, poor thing. I wonder if there's any way he could have found his way home? Wonderfull foto, and interesting information. It's not very often that you post a bird that I have seen in the last few weeks - but this post is an exception! I saw Inca Doves in Arizona a couple of weeks ago!